Sweeten up your Valentine's Day lunch with this French toast recipe. 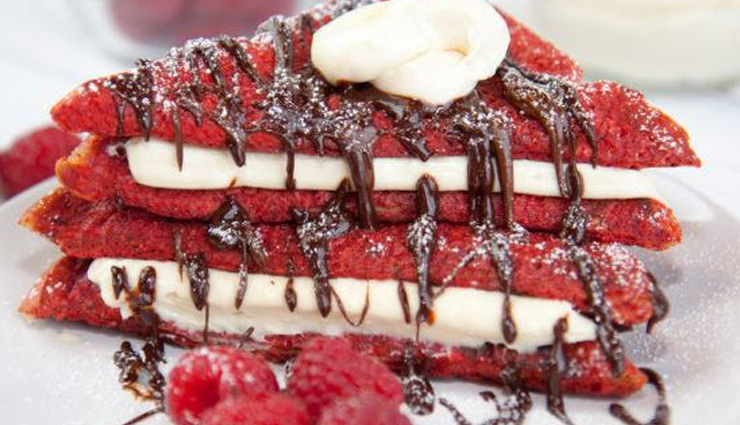 Drizzled with Nutella, these red velvet french toast slices also feature a decadent vanilla bean cheesecake filling. * Whisk together the eggs, buttermilk, sugar, vanilla, food colouring and cocoa in a shallow bowl until smooth and lump free. Alternatively, combine these ingredients in a small blender or magic bullet cup; blend until smooth and transfer the egg wash to a large shallow bowl. * Dip bread slices into egg wash and press lightly a few times to soak through completely. Flip each slice and repeat with each bread until slices all are evenly coated. * Heat a large nonstick pan/skillet over low-medium heat and fry the bread in batches of 3 or 4, turning once until just cooked through. Remove and place onto a warmed plate. * Combine the cream cheese, sugar and vanilla paste in a medium sized bowl, and whip until light and fluffy. * Spoon 1-2 tablespoons of filling onto 6 toast halves; spread to evenly coat; top with remaining toast halves to create a sandwich. * Drizzle with melted chocolate; top with remaining cream (optional); dust with icing/confectioners sugar and serve with berries.